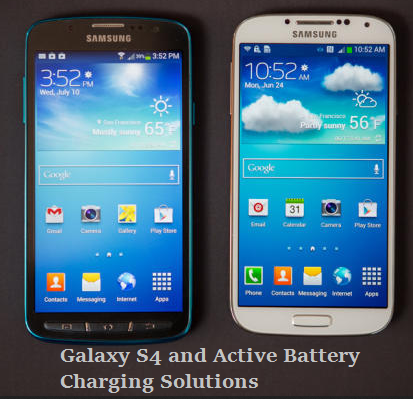 Samsung Galaxy S4 and S4 active are the latest top end smartphones from Samsung with some amazing features but there have been some problems with the Charging of Galaxy S4 and S4 Active. The Samsung Galaxy S4 and S4 Active for some users is taking many hours to charge before getting to 100% Full charge and many times it is being discharged rapidly on use. Mentioned below are some of the reasons for the problems and the solutions to the battery charging problems. Solution 1: Use only the Original Samsung Charger and Connecting USB wire and in case a duplicate charger or wire are used it is the main reason for slow charging of your Samsung S4 device and also Fast Battery discharge. Solution 2: Problems with connecting wires of Samsung Charger and USB wire can also be an issue of Slow charging of your device. So connecting the USB wire with Charger properly will solve the problem. Solution 3: Use a charger with similar AC and DC and see if that makes a difference. You can check the charging rate via Settings > Battery where it will say “Charging (AC)” or “Charging (USB)”. Make a note that Cahrging with USB is much slower. Solution 4: A lot of Apps running in the Background or the Screen staying awake without turning off can also cause faster draining of the Battery so you should turn off the Stay Awake option from: Go to Settings > More > Developer options and un-check Stay awake. i too had slow charging problem.. i thought it was bcoz of update..but it was bcoz of usb cable.. As we will be removing it frm adapter, it becomes loose..